This depiction of a charioteer is a Roman-era mosaic from the 3rd or 4th century. The snapshot is from Sebastiá Giralt's flickr photostream. If you like ancient mosaics, I've just discovered a wonderful blog called the Mosaic Art Source Blog! The post on horses in mosaics is not to be missed! They have collected a wonderful set of photos of both modern and ancient mosaics from a variety of sources, all featuring horses. Browse the blog for posts on other subjects, too. I loved this post featuring lions. 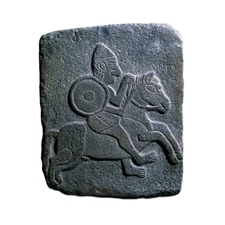 This beautiful stone relief from the 10th century BC shows an Aramaean warrior on horseback. The way the rider's hand is held makes the horse's leap seem playful, though I think it is simply a composition decision to prevent the arm overlapping the horse's neck or the rider's other arm, which holds a whip. I think the horse looks like it is smiling slightly, which adds to the playful impression I get, although if you enlarge the image you can see that the rider certainly isn't smiling, just the horse! Go to The British Museum site to see a large image and a detailed description of the origins and significance of this piece. Louise Firouz, an American woman who discovered and promoted the rare Caspian Pony, has died. Caspian Ponies, genetically linked to the Arabian horse, are a native Iranian breed. Firouz discovered them while traveling there, and exported some to Europe and the US. Already rare in Iran, they were decimated in their homeland during the revolution and subsequent wars. Despite the upheavals there, Firouz (who had married an Iranian man) lived most of her life on a farm near Turkmenistan. Read more about Caspian Ponies here. And the full obituary from the Washington Post here. The Moscow Kremlin Museum has an amazing collection of ornate horse gear from Tsarist Russia, Turkey, Persia and Western Europe. Most impressive are the ceremonial pieces made of gold and precious stones, like these Turkish stirrups. Check out the museum website for more info and some great photos. This site (caution - I had some weird political popups & hijacking after visiting this site, but can't be sure it was because of them) also has some additional photos from the same collection, taken from a traveling exhibition in the United Arab Emirates. This is a nifty video featuring Arabian horses - and nicely produced, too. Note the scene near the beginning where the horses come in from the pasture to eat... camel's milk and dates! A good source of protein and calories, especially when grass or grain are not abundant. This video appears to be shot at a rather fine Arabian breeding and training facility in the Middle East United Arab Emirates, I think, after further research. There is an additional video of the same trainer, Ali Al Ameri, here.